I like pizza. Brandon LOVES pizza. 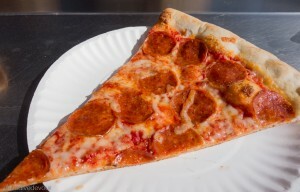 So when we got to Austin, he compiled a list of pizza places for us to try based on his research and opinions from local redditors and others. 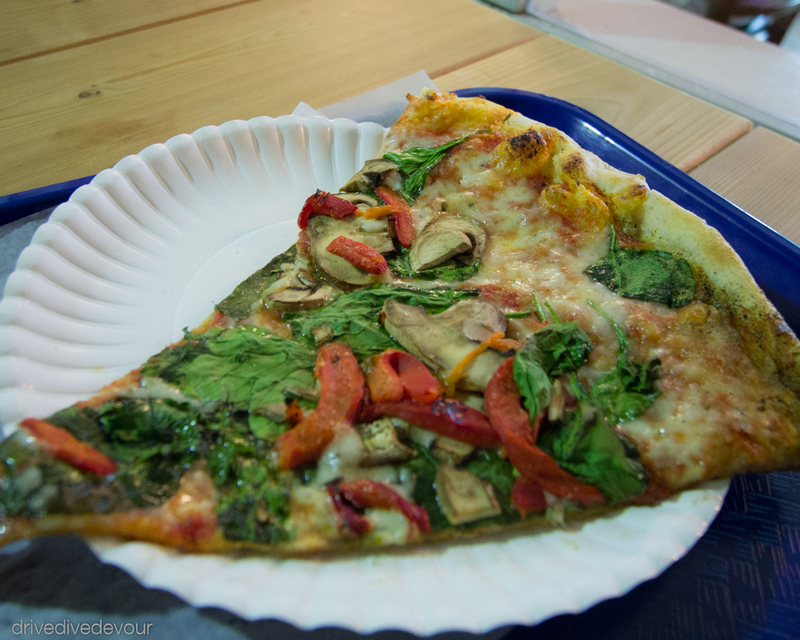 We didn’t make it to all of them (I wish we had gotten out to Pieous because they have other types of pies, too), but we did make it to a lot of pizza places in a city not known for pizza. 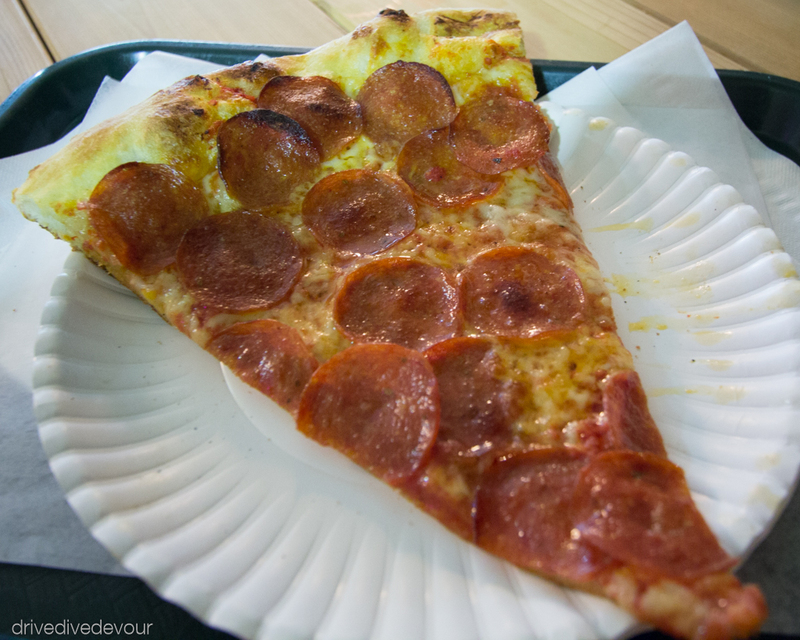 Homeslice is a well-known Austin establishment serving up NY style pizza. We chose to go at lunch time to the take-out counter and bring the dogs. 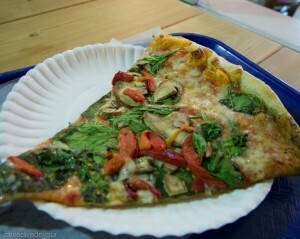 The slice options are limited, but they always have veggie slices, so fear not my veg-head friends. 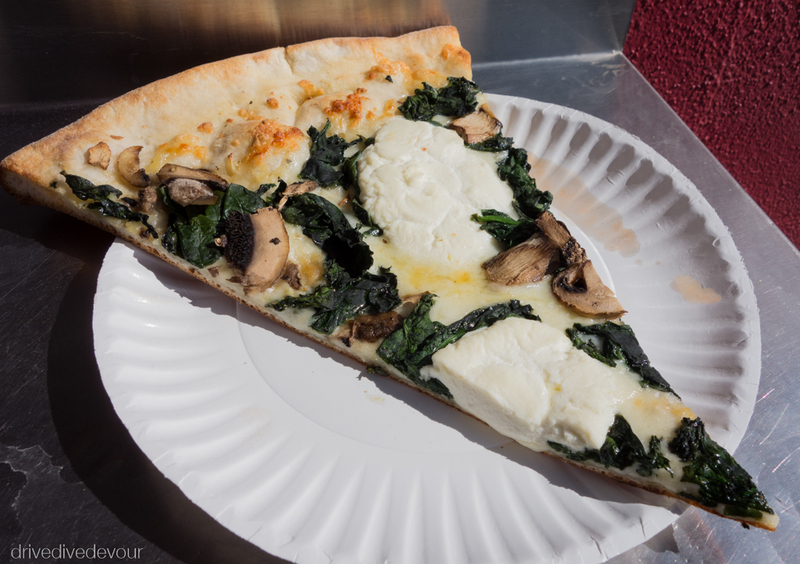 We tried one slice of each offered: pepperoni, sausage and garlic, margherita, and a white pie with spinach and mushroom. They did NY pizza justice with slices that were large with a nice NY style crust, thin and not too chewy. The sauce was also a typical NY red sauce. Brandon thought the cheese was a little light, but it was just right for me. 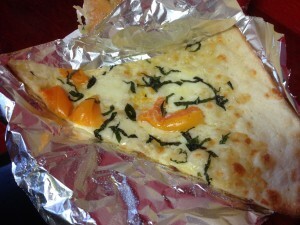 The toppings were fresh and I love a good white pizza and this one hit the spot. The ricotta was nice and smooth and since I love spinach and mushrooms, I chose the perfect day to go. 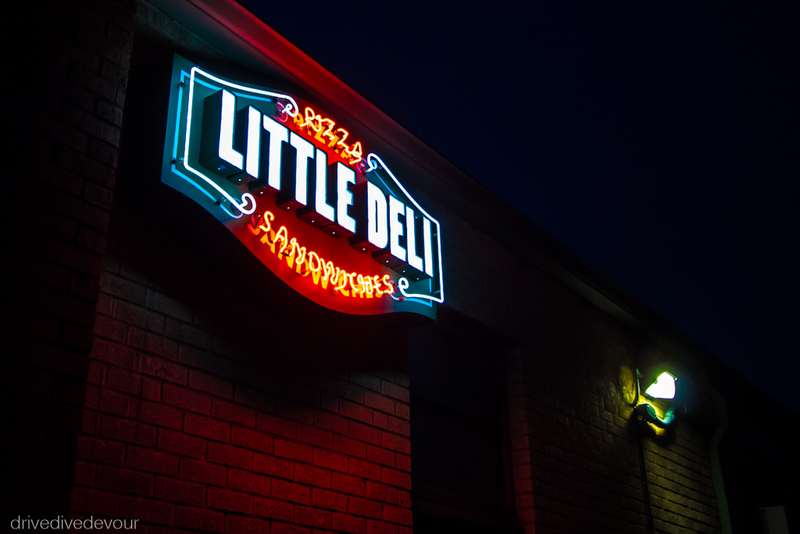 Little Deli was a little out of our way being on the Northside, but we stopped by on our way back from Dallas as it was mentioned quite a lot in the forums. 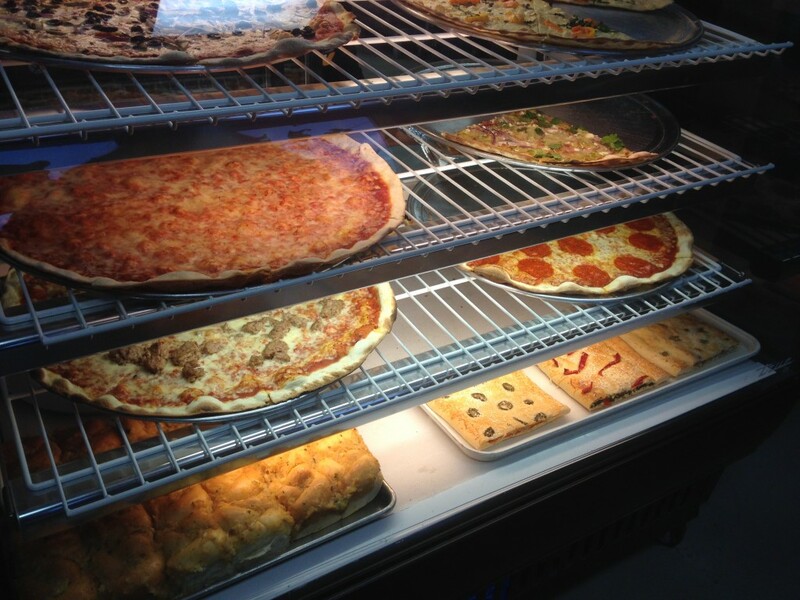 It’s a small place with a bunch of outside seating and they serve both pizza slices, pizza made to order, and sandwiches. Oh and the pizza is New Jersey style. 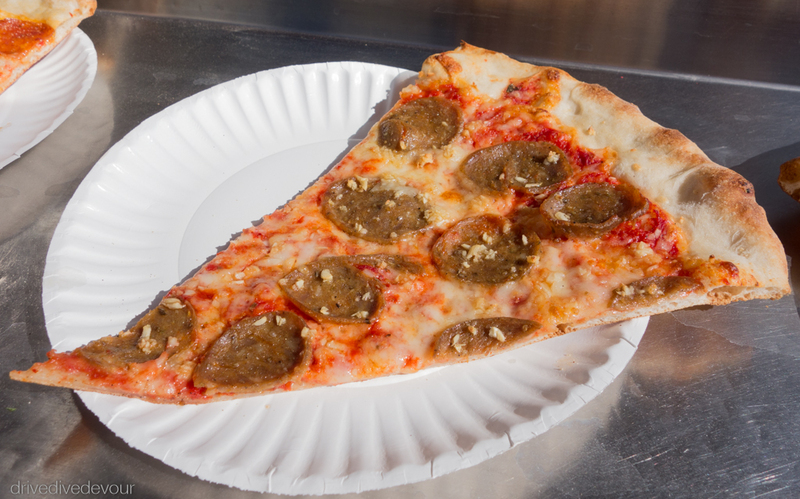 As Brandon says, we did a nickel in NJ (we had a view of NYC on the Hudson), so we’ve eaten a lot of NJ pizza. The crust was blistering, but a little thin and chewy. The toppings were fresh and nice and Brandon loved the pepperoni. The sauce is what threw us off. It tasted heavy and over seasoned. It was like the whole jar of oregano and other spices fell in. Overall, it was good, but not worth the drive from our Southside location. 5 pizzas: Eat until the end of days! 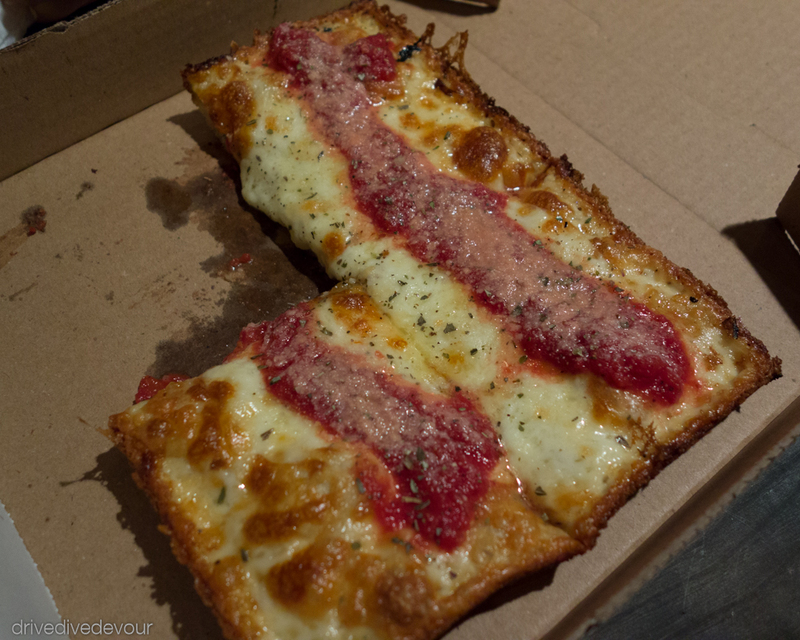 Who knew there was Detroit style pizza? We didn’t. 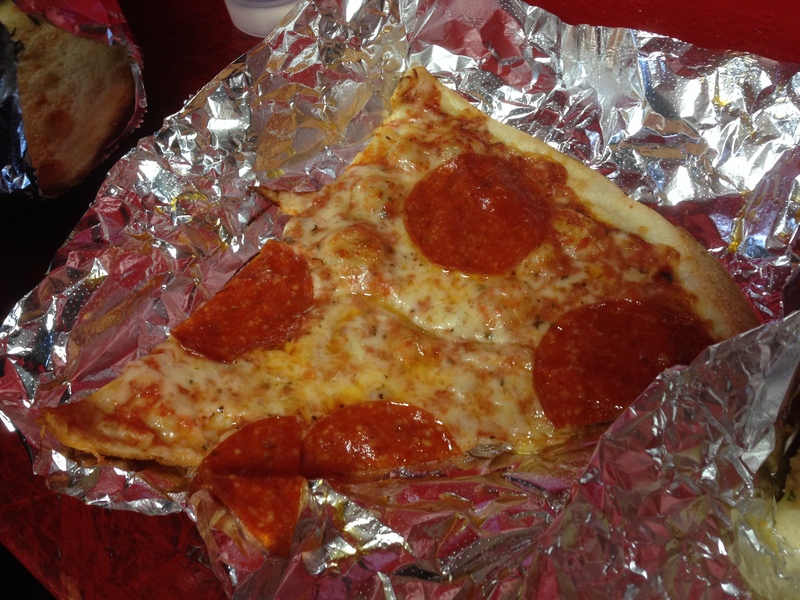 And we didn’t expect to find it in a food truck parked next to a bar in Austin. But boy are we glad we did. This little truck bakes all their pizza in square automotive parts pans like those used on Detroit assembly lines. It is basically Sicilian style with a Detroit flair. The toppings go from edge to edge and so the cheese bakes up into crisp, caramelized edges. I actually managed to order a cheese-less pizza the first time we went, but it took me a while to notice. The sauce topping the thick focaccia-like crust was so delicious I didn’t need cheese. 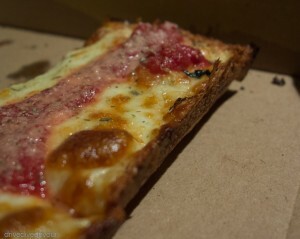 Brandon had The Detroiter with two kinds of pepperoni, smoked and natural casing and loved every bite. The next time we went (yes, we had to go back it was that good) we ordered the Four Cheese to spilt. The thicker cheese was a little too much for me and I think I would have been better with the Classic Cheese. Brandon had no issues with the cheese whatsoever, so it’s all personal preference. 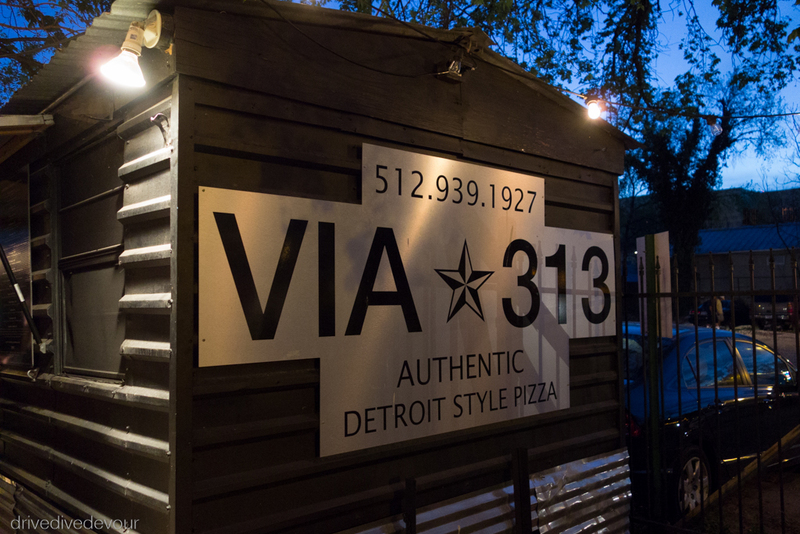 This is definitely our recommendation for pizza in the Austin area. I wish we had better pictures to entice you. The first time we went, we sat in the adjoining bar and it was too dark to get a shot. The second time, we got a little anxious to eat as you can see below. It just means it was good! 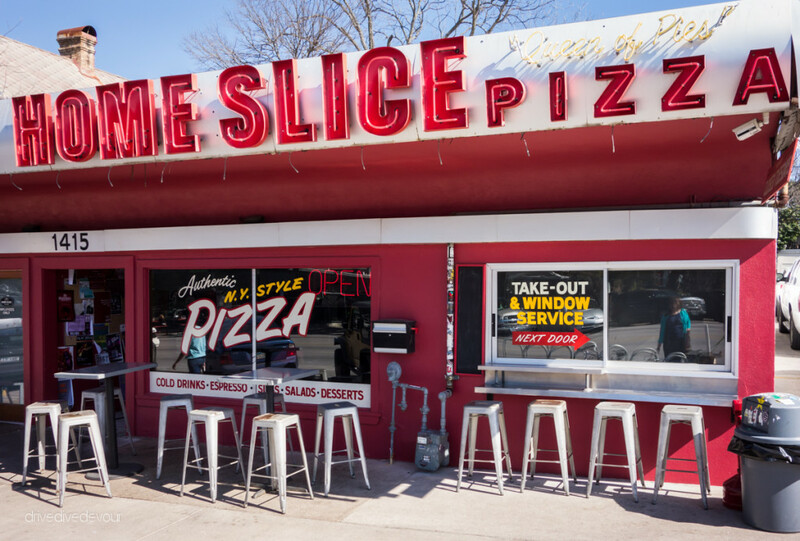 Another Austin pizza institution, we picked up slices at their Anderson Lane outpost before my scuba diving class. The selection is creative and varied. 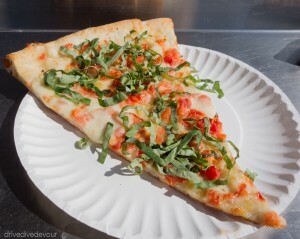 Along with the standard red sauce pies, you’ll find ones built on black bean sauce or spinach curry. We picked a couple of slices out of the case from the ready-made pies and sat down in the tiny space to wait for them to be heated up. When the paper plates arrived, we each took a bite and agreed this pizza made the cut.